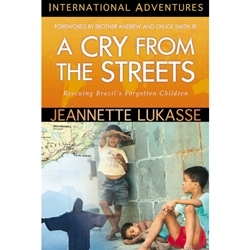 In the dark world of the Brazilian streets, children, toddlers and teenagers search trash cans for food, steal knives to protect themselves at night, and live in fear of being beaten or even killed by the police. For these desperately needy children, nothing was free - until they encountered the love of Jesus through the compassion of Jeannette and Johan Lukasse. When this young Dutch couple asked God if He could use them to do something about the immense suffering they saw in the world, He led them on a winding path from their home in the Netherlands to the coast of Greece and eventually to the streets of Belo Horizonte, Brazil. Their calling was clear: millions of orphaned and abandoned children were living and dying on the streets, caught in the deadly grip of drugs, violence, prostitution, and abuse. What followed the Lukasses' step of faith is a stunning example of how God miraculously uses the surrendered lives of believers to transform the lives of others with His hope and healing.